Now that Steven Birchfield has published his reasons for his assessment of Macron being the victor in tomorrow’s French Election. I reviewed the chart for the opening of polls, although naturally I have made the prediction of Le Pen as Victor, I stand corrected by a Master! Mercury is the Pushing planet and gives his gift to Saturn, but Saturn, being retrograde and thereby also applying to Mercury, returns Mercury’s gift to him. In other words, Saturn gives the crown back to Mercury. “…that the pusher is direct in course and the one to whom it is pushed is burned up or retrograde, and both are in an angle or in the follower to an angle.” Well we do have this with Mercury and Saturn. 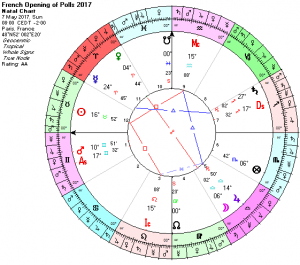 Mercury is direct and in a succeedent house (the 11th) while Saturn is retrograde and in the angle of the 7th. So I honestly have to answer yes to this consideration. Both are either in an angle or what follows an angle (succeedent). I had also taken Venus from the April chart to be in exaltation and again, overlooked the fact that Venus, significator of women, has now moved into the sign of her detriment in this chart for the 7th May. Namely Venus has moved from Pisces into the sign of Aries. Furthermore, Mercury, as I mentioned previously, although peregrine, has mutual reception with Mars. Mars is the significator of the Governments seconds (11th house) and they give their support to the favourite. The favourite is controlled by the Governments allies. The soldiers and generals give their all to Mercury and he reciprocates the favour. Mercury is peregrine and this perhaps echoes Macron not being openly affiliated to the major parties. The challenger (Le Pen) indicated by Jupiter, is in the sign of Libra that is inimical to Mars as it opposite to Mars’ sign. Jupiter is owned or disposed of by the weakened Venus in Aries, who in turn, is under the control of Mars and Mercury. So spending a little more time on this chart and it looks as though Macron will take the prize. I made my prediction and have to stand by it, but I feel the Master, Steven B. is on the right track. Macron = Mercury in Aries in the 11th house of good fortune, direct and not combust. Applying by trine to Saturn, significator of victory. Le Pen = Jupiter in Libra in the 5th of minor good fortune (but in her turned 11th), retrograde and below the horizon, not applying in motion to Saturn. Sharon Knight Astrologer of the Year 2016.